The Beijing Treaty on Audiovisual Performances protects performers in audiovisual performances such as films, TV series and musicals. 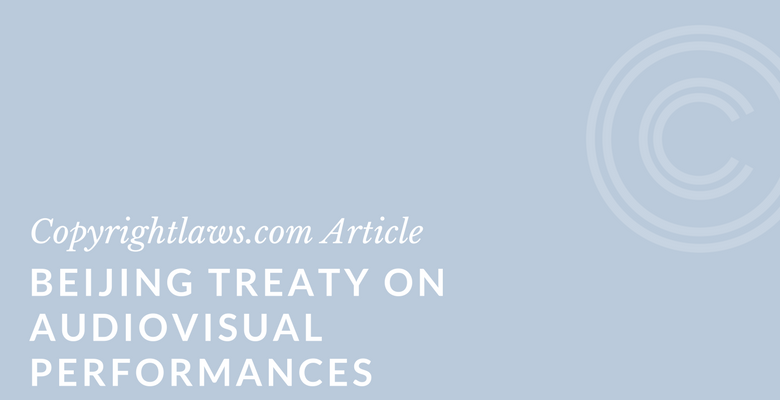 As of 2012, performers in audiovisual works have a treaty of their own. The treaty was named in recognition of the city of Beijing, which hosted the final round of negotiations from 20 to 26 June 2012. This concluded over 12 years of negotiations. These new rights must last at least 50 years in member countries. They must be automatic and not subject to formalities such as registration or the use of a copyright symbol or notice. Click to read more about the Beijing Treaty on the WIPO website. Test your international copyright law knowledge here. When Will the New Copyright Treaty Take Effect? The Beijing Treaty isn’t yet in force. It will only become effective after 30 countries have ratified or acceded to it. You can check for updates to the contracting parties to the treaty here. A new copyright (or copyright-related) treaty is a big deal. The Berne Convention is evidence of this. Berne came into force in 1886 and is still in effect. With its revisions, Berne remains the leading copyright treaty, setting minimum international copyright standards in the 176 member states currently adhering to it. The number of Berne members changes from time to time. You can check for updates on the WIPO website, here.